and it appears that the same organs in the inner ear, the otoliths may be central to both conditions. Given that the same organs may produce the same symptoms, one explanation is that the wind turbine acoustic emissions may, in fact, induce motion sickness in those prone to this affliction. Finally, It is shown that the probability that sensitivity to motion sickness and sensitivity to wind turbine acoustic emissions are unrelated is less than 2 in 1,000,000. They examined field data in cases involving individuals exhibiting a range of symptoms including motion sickness-like sensations. They then reviewed a 1987 paper about motion sickness in navy pilots using flight simulators. A relationship between frequency, G force and vomiting was established in this study – and a nausogenic frequency region identified. 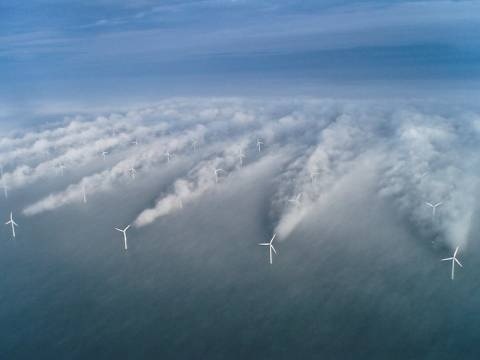 The argument was made that similar conditions could be established by 2.5MW wind turbines with a blade pass frequency of 0.7Hz. They then looked at motion sickness – and found a study showing that about 10-15 % of the population are highly sensitive to motion sickness, and – at the other end of the spectrum – another 10-15% are largely not susceptible to it. 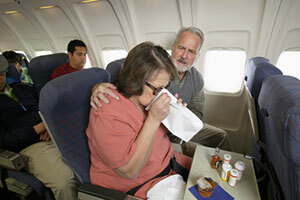 Their hypothesis is that wind-turbine acoustic emissions trigger motion sickness in those who are susceptible. And then they found that those people who were experiencing motion sickness symptoms from wind turbines, in the study area and beyond, always described themselves as being part of the group that were “highly sensitive” to motion sickness. They argue then that the null hypothesis – that sensitivity to motion sickness and sensitivity to wind turbine acoustic emissions are unrelated – had a probability of less than 2 in a million. Schomer & Co considered that turbine placement may be a part of the problem and relate to the extent of motion sickness like symptoms experienced by turbine neighbours. In a point that wind weasels will die in a ditch to resist – the authors insist that any meaningful wind turbine standard must include infrasound measurements and that a proper level be set – along with a protocol and standard for the equipment used to measure it. The paper is cited as: Schomer, P. D., Erdreich, J., Boyle, J. and Pamidighantam, P. (2013). A proposed theory to explain some adverse physiological effects of the infrasonic emissions at some wind farm sites. Proceedings of the 5th International Conference on Wind Turbine Noise, Denver 28-30 August 2013. You can download it here [Download Full Paper]. How to create massive air-pressure variations over vast distances. All makes sense to STT – if you stir up the fluid in the inner ear with massive air-pressure variations (100 or so giant fans, each with 3 x 56m blades with their outer tips travelling at over 350km/h should do it) – while the spatial environment appears static to the other senses – if you’re so inclined – there’s a fair chance you’ll lose your lunch. Professor Alec Salt – crack neuro-physioligist – talks about how infrasound works on the sophisticated mechanism that is the human ear in this video. Think of a rough sea passage at night. You’re stuck in the bowels of a heaving ship and a few of your fellow passengers start heaving too. The stoics hold it together and seem nonplussed at the retching of those with their heads wedded to their paper bags. For those inclined to puke – it’s all about the response to sensory dissonance – the eyes tell the traveller that the ship is still (the room isn’t apparently moving) but their ear fluid is being sloshed about in unison with the pitching vessel. It’s the mismatch in the signals to the brain that brings on the passengers’ gastro trauma. And this victim impact statement from Donald Thomas of Waubra, describes motion sickness as one of the adverse health impacts he and his family experience under certain operating conditions which are part and parcel of Acciona’s non-compliant Waubra wind farm. I used to walk on the outer wall of the Centerpoint building in the City. I even have been on the overnight ferry to Tasmania in bad weather, where half the people on board got seasick – but I didn’t. Yet staying in my home in Waterloo, South Australia, would make me feel heavily nauseated, with a turning stomach, headaches and feeling like I would vomit nearly all the time. Then I would go out in the boat with my son fishing and I would be fine. So to me, being in my home next to the Waterloo wind turbines does feel like what I imagine seasickness to be like, yet I am not otherwise prone to motion sickness – so perhaps it is still something different? If the “powers at be”(Gov. agencies, DEP, BOH, etc) really wanted to know how people felt about IWT’S (Industrial Wind Turbines)….don’t you think they should ask the people who are MOST impacted by them?…Like, the folks who are FORCED to LIVE under these ungodly monsters…. It turns your life upside down and you don’t know where to go…..where to go to get some sleep, where to go to get help, where to go to live or what to do next?? If you love your home like I did…your dream is Gone! The true science will come out we’re sure…eventually. Great work all. In 23 years service in the RAN, on all sorts of ship sizes and shapes and in all sorts of sea conditions, I never met anyone who never got sea sick. It just took rougher and more prolonged unfavourable conditions. I know what it feels like to be sea sick, from a mild head ache to confined to the bunk totally unable to perform my duties. That was 24 years ago. Occasionally even now, at 2.5km distant from turbines, I get mildly nauseous for no apparent reason?? With all the complaints being made about turbine noise and health problems around the world, one would think that by now someone would have organised a broad ranging study of the issues. This is a task that will cost millions of dollars and involve many scientific disciplines as well as electricity grid managers and of course, wind turbine power suppliers. We know the wind industry will not participate as it would be tantamount to cutting their own throat (they already know the outcome). Turbine hosts will lie thorough their teeth to protect their lucrative incomes (I am a turbine host and personally know the position of my neighbouring hosts). The electricity grid managers will be unwilling as it would entail coping with multi megawatt wind power producers being started and stopped at intervals. This would put at risk the integrity and security of the national grid. Having driven large scale steam and diesel power plants in the RAN, I know how fiddly it is to manage multi plant systems. The other way, which is just as expensive, is to do what NASA has already done and that is to construct a stand alone wind power plant comprising a number of turbines, not grid connected but with a load connected to match the turbines’ installed capacity. Residences would have to constructed of varying styles and populated with long term unbiased volunteers. The multidisciplinary tests would still need to be conducted. Once again, all this is going to cost millions of dollars. Who is going to put their hand in a very large pocket? Certainly not the wind power industry. Governments find it cheaper and easier to ignore the problem hoping it will go away. Well, this one won’t!! None of us who are being impacted, individually have the funds available to finance the necessary testing nor the funds to prosecute the litigation that should be before the courts now. We are mostly just individuals and at best, small groups and the wind industry and the governments know that. We pay our taxes and so we demand that the government step up to the plate and do the right thing, and for goodness sake, don’t ask the wind industry for its cooperation, legislate to demand it! And do it NOW. I could go on, but I had better leave room for someone else. It is one thing if you suffer this type of motion sickness in a plane, boat, bus or car as when you finish your journey, you get well again. When you live in and around these industrial turbines and suffer from this type of motion sickness, then you’re stuck there, and it is BLOODY torture for the sufferers. This is human brutality of the highest and cruelest kind. The wind weasels and greentards, and also the people in authority, should be cast into the dungeons, for letting this abuse to go on. The human rights authorities should be all over the wind industry like a mouse plague until this corrupt industry is STOPPED for good. There is nothing green about the wind industry in any shape or form, it is hell upon earth for the sufferers. Just like the kid at the carnival, who vomits on the rides, the victims of wind are NOT faking it! When people ask me why everyone doesn’t get sick, I always tell them, for the same reason that everyone on the rides at the carnival doesn’t get sick from the rides. Some people love it, and others are nauseated, dizzy, and get headaches. That doesn’t mean they are faking it….of course! Only a windweasel, trying to avoid accountability, would say such a stupid thing.